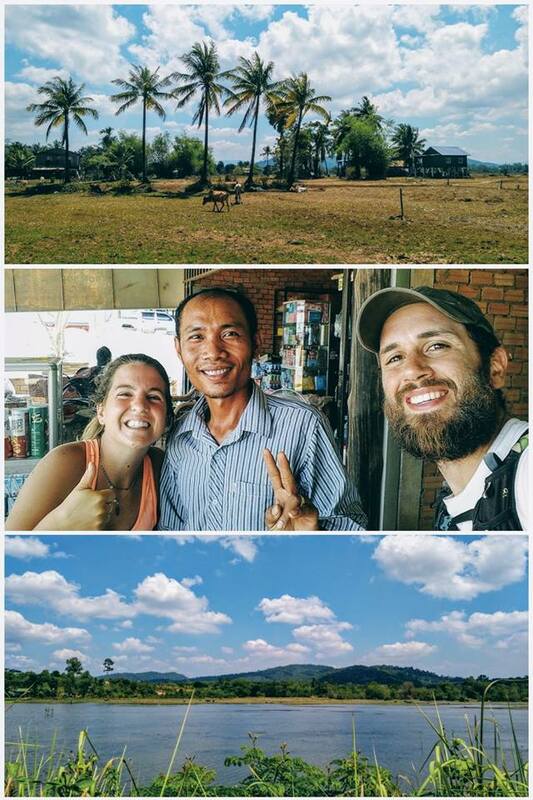 These last days in Cambodia are characterized by beautiful and completely different panoramas: first we ride alongside fields of arid land (future lush rice crops), in the shade of tall palm trees, enjoying the way with silent cow pastures; to then face long climbs on green hills, dense vegetation, enlivened by the most diverse chirps, inside the Boutum Sakor National Park and the Peam Krasaop Nature Reserve. Riding becomes much more challenging, given the slopes and the hot climate. We start riding at the first light of dawn but the temperatures are already high: at 6 o’clock there are 22 – 23 °C and we exceed 40 °C at around 12 o’clock. Not every day we meet local people who speak English, and when this happens it’s always a wonderful reciprocal exchange: the owner of a small shop on the street welcomes us into his home and we talk about cambodian daily life, sipping coconut water; a lady gives us for free bananas and rice biscuits handmade, and hugs us like we were her children, despite is the first time she saw us.